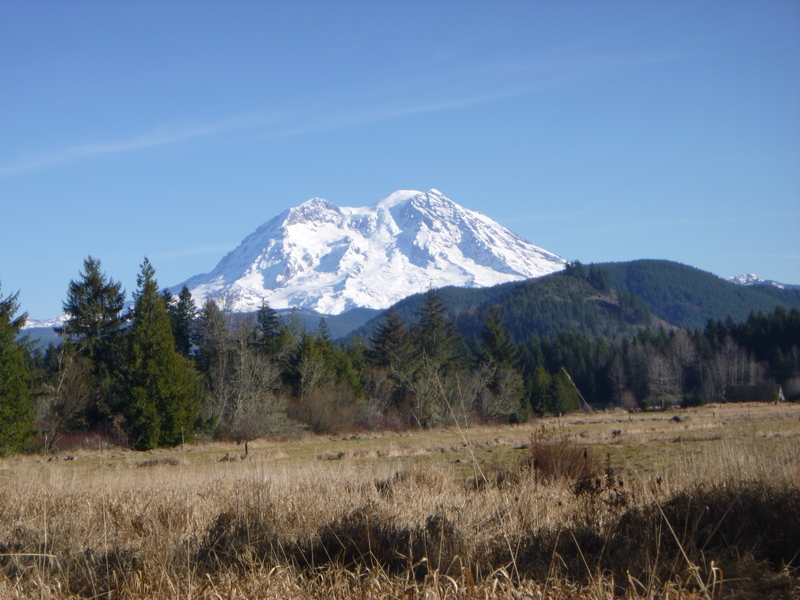 We decided to take the shotgun for a walk so the dogs and I headed toward Mt Rainier. ..and we drove up in the boonies near Morton. C’mon, we’re almost to the top! Hmmm. No bird on that hill either! There was lots of time to take pictures and I could have left the shotgun at home. We didn’t see a single grouse. None of God’s innocent little creatures were harmed in the making of this blog post, but I must confess that we had mayhem in our hearts and minds! We just couldn’t find any birds that wanted to cooperate. It was a beautiful day and everybody agreed that the air was fresh and the sun was bright. We were thankful for that! Just inside the door of my kennel building is a whiteboard where I write down important stuff that I need to remember about my clients, the dogs, that is. Sometimes it’s a reminder to administer meds or supplements. Other times I might have a reminder that Fido, in kennel 6, needs extra attention for some reason. One thing I wrote on the board has stayed there for months now. I read it every day and think about it. 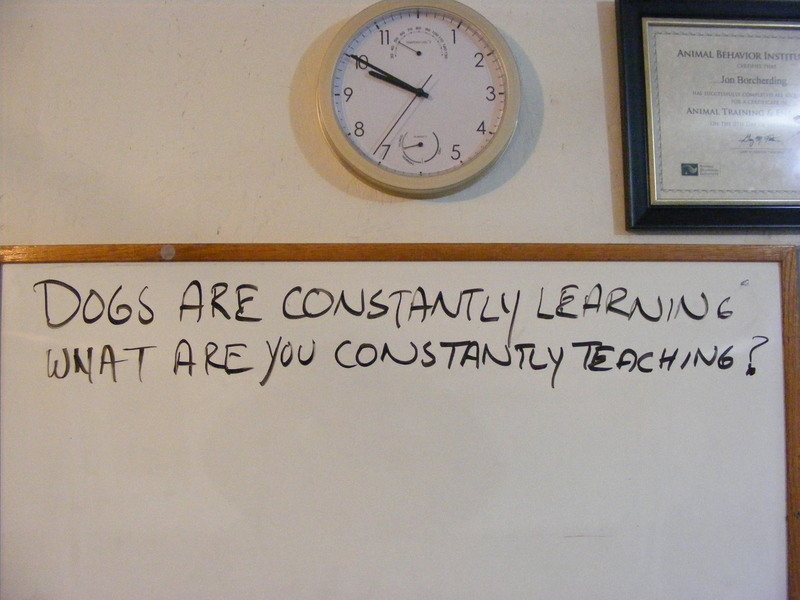 Dogs are constantly learning. What are you constantly teaching? One of the big advantages of placing a dog at a kennel for training is that the trainer gets significant control over the dog’s environment. Many of the canine behaviors that humans find most troublesome are actually behaviors they have inadvertently taught them. Sometimes half of the battle of training a wild young dog is just getting him out of his current environment and into the kennel where his life becomes very structured and chaos is kept to a minimum. A typical scenario is the young dog that gets out of control simply because he was too cute for his own good as a puppy. His guardians have allowed him to pretty much run the house until they got tired of the jumping/chewing/counter-surfing. Then they threw him in the back yard and he started working his magic on the landscaping. This might be a good time for them to consider having their dog boarded and trained (unless they want to wait while he finishes eating the siding off the garage). In the kennel, we can provide structure in the form of well-defined spaces, consistent schedules, outdoor exercise and training. While Fido is at boot camp you can do damage control at home and adjust your habits to help keep him successful when he returns. Thank you for reading this shameless plug for boarded training in general and boarded training at Muck Creek Kennels in particular. We now return you to your regularly scheduled programming which includes an update on wonder dog, DIESEL! Stay Tuned! What a Bunch of Sit! Diesel’s training is progressing nicely. We have a Front-Sit that’s working well. In the coming days we’ll try to build a Heel-Sit too. First I think we need to work on steadying his Front Sit so that I can walk away and trust him to hold Sit reliably. I begin this phase by stepping carefully to the right or left while he is in Sit, then returning to my position and reinforcing his steady Sit with a click and treat. As he becomes more reliable I will stretch my movement until I can walk completely around him while he holds the Sit position without moving his furry little bottom. I don’t normally train a “Stay”. I think Stay is a goofy command because its meaning is so arbitrary. Want the dog to stay in the car while you run in the store for a minute? You tell him Stay, right? Want him to keep sitting next to you while you fumble with your house keys? Tell him Stay! And what do you tell him as you walk out the door and want him to remain in the house? Stay, right? Each one of those Stays means something different to the dog. In many cases he can be expected to break the command because you really can’t expect him to remain on Stay for 4 hours until you get back, so he breaks stay the minute you’re out of sight. If you’ve used Sit and Stay, he now gets to blow off 2 of your commands in one fell swoop! What does Stay mean? 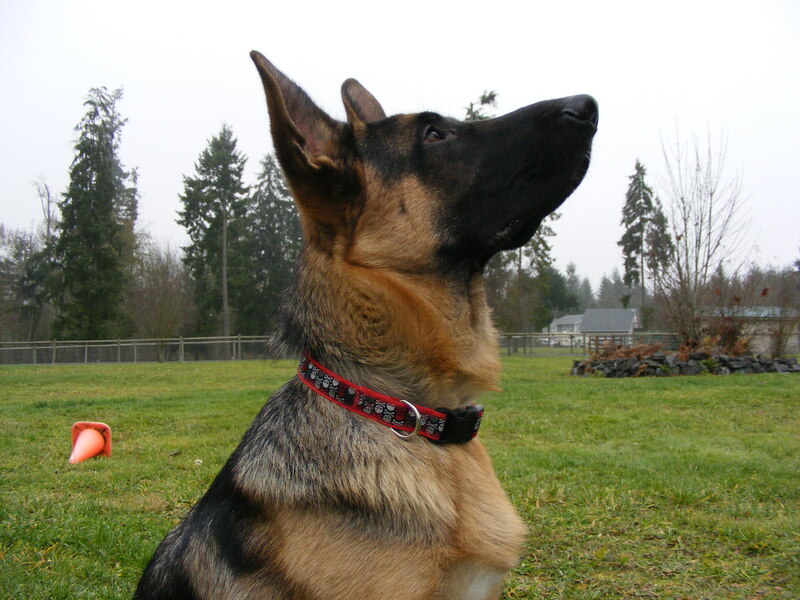 And, since your Stay command is arbitrary to the point of being almost meaningless, why should he listen with rapt attention to your other cues/commands? So, Sit is a big deal in my program because it’s the cue/command that replaces Stay. This book is the result of a collaboration between members of a yahoo discussion group dealing with clicker training. It is published by Sunshine Books which is part of Karen Pryor’s clicker training empire. 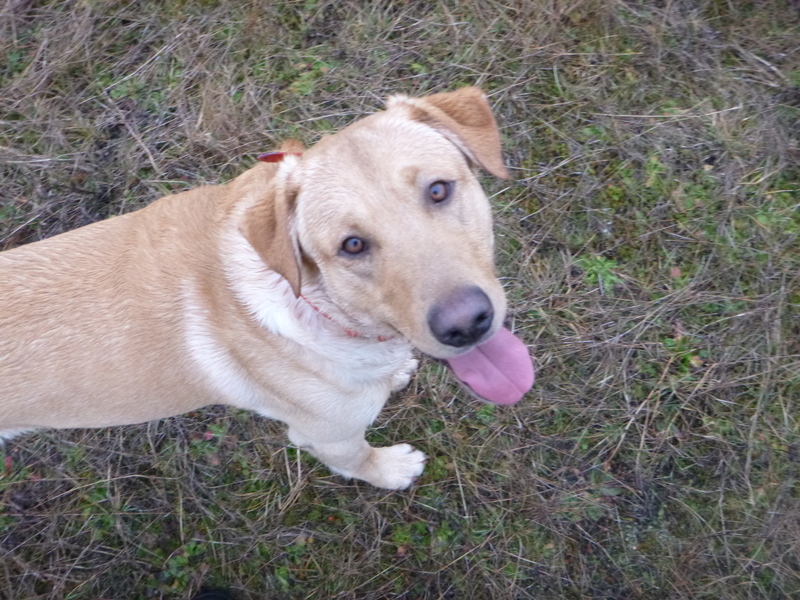 If you were to ask the average gun dog trainer to explain learning theory, he or she would not be able to do so and might even scoff at the idea of needing to understand such a thing. Blanket statements such as the quote above do nothing to enhance the view of clicker training in the eyes of the “traditional trainer”. Rather, these kinds of derisive comments serve only to alienate so-called traditional trainers and boost the egos of the authors who apparently harbor a sacrosanct belief that theirs is the only “right” method. My question is this: If you truly believe in positive reinforcement then why don’t you just present the positive and effective aspects of your methods rather than using so much space to criticize and impugn the methods of others? In a book as short as this (100 pages) it seems that all the space used to denigrate other methods is a product of the authors’ insecurity with their own techniques. On pg. 13 the authors tell us the one area in which they use traditional training methods is in “snake avoidance training”. For this kind of training the authors grudgingly admit, “electronic collar training is the most reliable.” Apparently they don’t want this kind of reliability unless it’s a life or death situation involving a reptile. Many trainers prefer to have this same degree of reliability in other situations as well. We’ve never hunted around snakes, but having a 100 percent reliable remote-sit has saved my dogs from peril more than once. The chapter on basic learning theory is helpful if you’ve never read anything about operant conditioning. The information is straightforward and well presented. There are some good explanations of the operant conditioning quadrant, the Premack Principle and other learning basics. The next two chapters go on to explain more detail about the practical use of positive reinforcement and how to keep records of training progress. Here the book shares a problem typical of clicker training literature, namely the seemingly endless use of jargon and acronyms. One would think that a tome espousing the wonders of learning theory would find some way to make its contents easier to digest without all the alphabet soup. …,in hunting the dog can drop the bird on the ground rather than delivering to hand as the dog must for tests and trials. 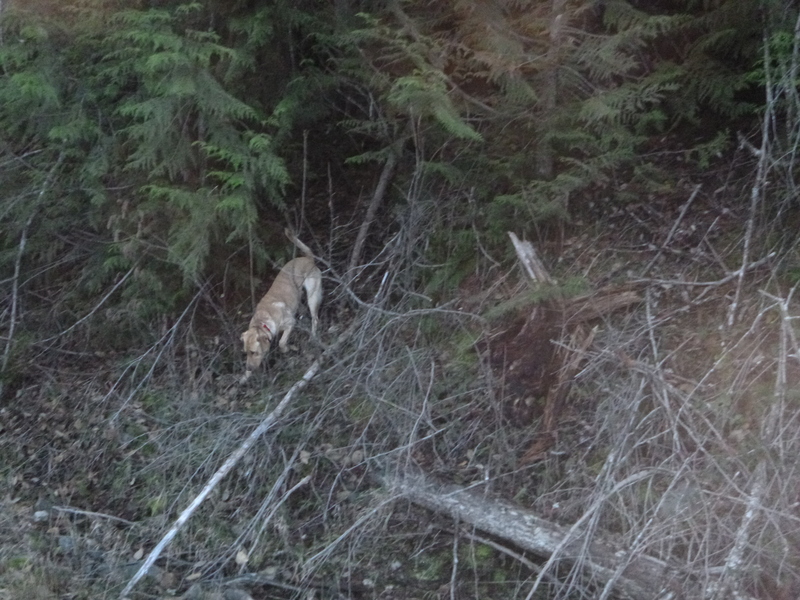 This statement indicates a lack of familiarity with hunting retrievers and the job they perform in the field. All of the bird hunters I know require their retrievers to deliver to hand. Dropping a bird at the hunter’s feet is a sure way to cause unsafe situations in the field because wounded birds can create quite a disturbance in a duck blind or a small boat. A quick game of “chase the bird” in a crowded duck blind is never a good idea. Loaded shotguns and wild bird chases in a confined space are a recipe for disaster. Another thing I find disappointing is the attitude that hunt test and field trial dogs are somehow superior to hunting dogs. 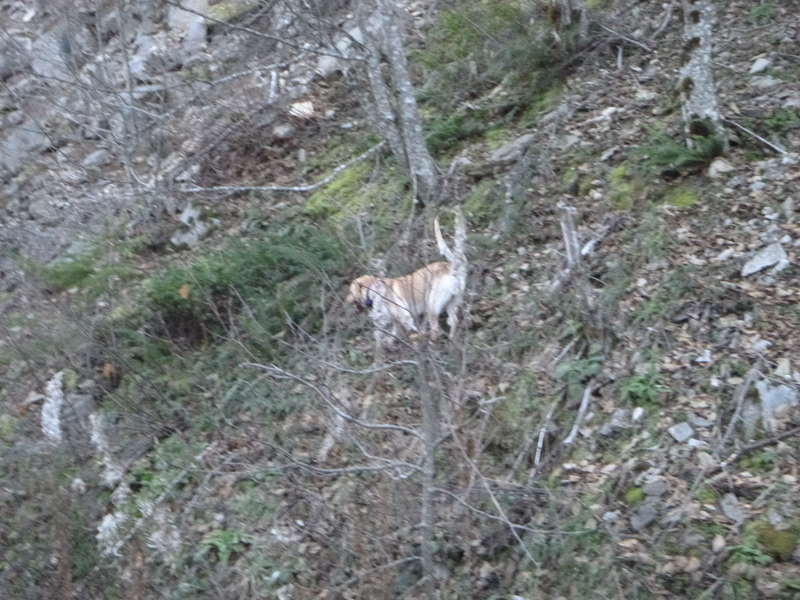 As in the example above, such attitudes are often based on deeply flawed assumptions about the role of a hunting dog in the field. What follows in the next 4 chapters is basically an adaptation of Rex Carr’s training system that has been used to train retrievers for 50 years. The system has been adapted to focus more on the carrot and ignore the stick, so to speak, but most of the underlying structure and drills are the same. I must admit that I experienced a bit of cognitive dissonance as I read the book. I attribute this to the unusual combination of its condescending tone, and political correctness combined with the fact that parts of the book actually mention bird hunting as if it were acceptable to the authors. In one paragraph the reader is admonished on the horrors of inhumane training and in the next we read about the importance of retrieving “crippled birds” quickly before they get away. All the while the book consistently uses the female pronoun for dogs; her, she, etc., as if the authors thought they were addressing a group of feminist duck hunters. Odd, perhaps that was their target demographic? 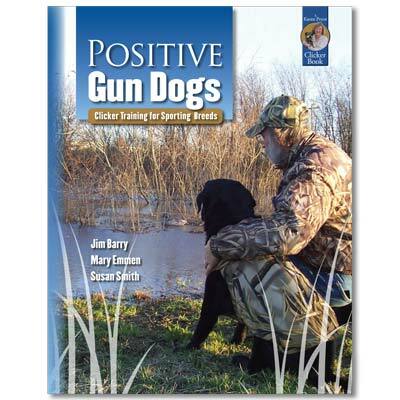 While the authors admit that virtually ALL the dogs performing at the top levels of gundog sports have been trained using traditional methods; they claim this is simply because the science of clicker training is so new that it hasn’t had time to reach the top levels of these sports. I seem to recall Karen Pryor making similar claims in the 80’s. 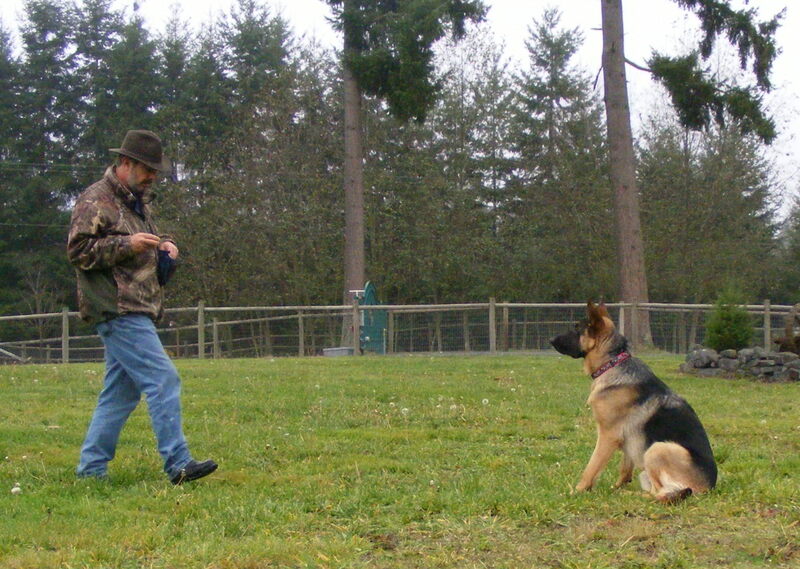 I spent a considerable amount of time and money to learn what I know about clicker training. I’m very glad that I did. Within the realm of positive reinforcement are some very powerful tools to help learning and behavior change. What I’ve also learned is that they are not always the best or most effective tools for every dog in every situation. Nothing in this book has changed my view which can be summarized as follows: Traditional methods work. Clicker training works. If you observe carefully, a dog will show you what approach or combination of methods works best for him or her. If you decide what approach to use based on human traditions or your own ideological convictions, you have ignored the dog. In closing I would like to add that $24.95 (plus $5 shipping) is entirely too much to pay for this book. That was FUN, but it’s time to get back to work. The kennel re-opens today after being closed for 2 months. The first dogs show up this evening and more are coming throughout the week. It’s been a glorious sabbatical! I’ve had plenty of time to work with my own dogs. 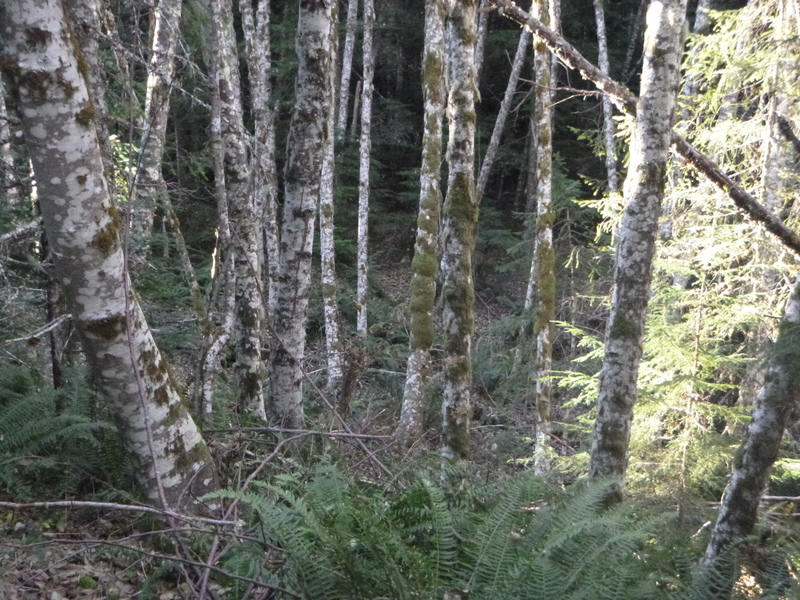 We’ve been hunting in Eastern Washington, the Olympic National Forest and some local areas that must remain secret! Kaia is hunting better than ever and Peck, who was just a bumbling puppy last season, has become a hard charging little bird maniac. 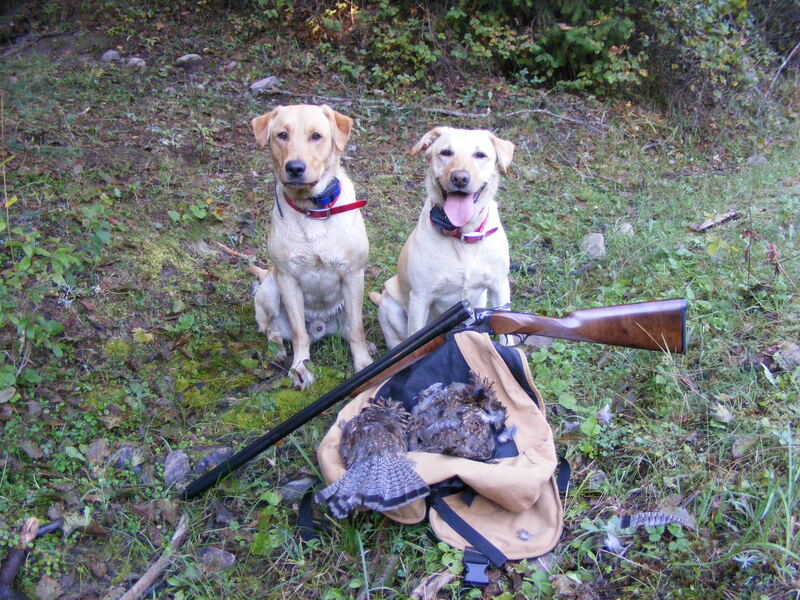 The re-opening of the kennel doesn’t end our hunting season, but it reduces it to a series of short, local hunts rather than the 3 week epic bird-a-thons we’ve been enjoying on the other side of the Cascades. I’m glad to be getting back to work. All this time off is great, but I miss having all the dogs around. I’ve had a chance to recharge and I’m ready to take on the wild beasts again! I have a class starting at Sprinker Center called “Click It, Don’t Kick It!” This is a positive reinforcement training class that runs for 6 weeks. We start up on Tuesday 11/5. You can get details and sign up info HERE. Oh…. I almost forgot… Don’t forget to bring your human! 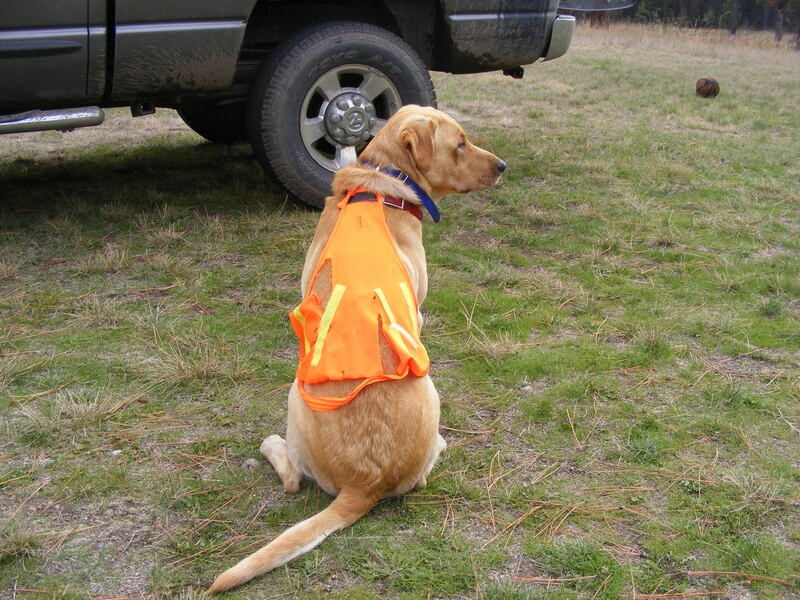 One of the things that appeared to be a fiasco during our recent hunting trip was the “Quick Spot Safety Vest” that I purchased for both of my dogs just prior to the grouse opener in September. I bought the vests from a popular online supplier of equipment for hunting dogs. I’ve had good experience with the company before so I had no reason to expect anything but good quality stuff from them. These vests may prove to be an exception to that rule, but I haven’t completely made up my mind yet. The picture above shows Peck in his vest after we returned from the first hunt in which the vest was used. I didn’t put the vests on the dogs until the day before the deer hunting season began. 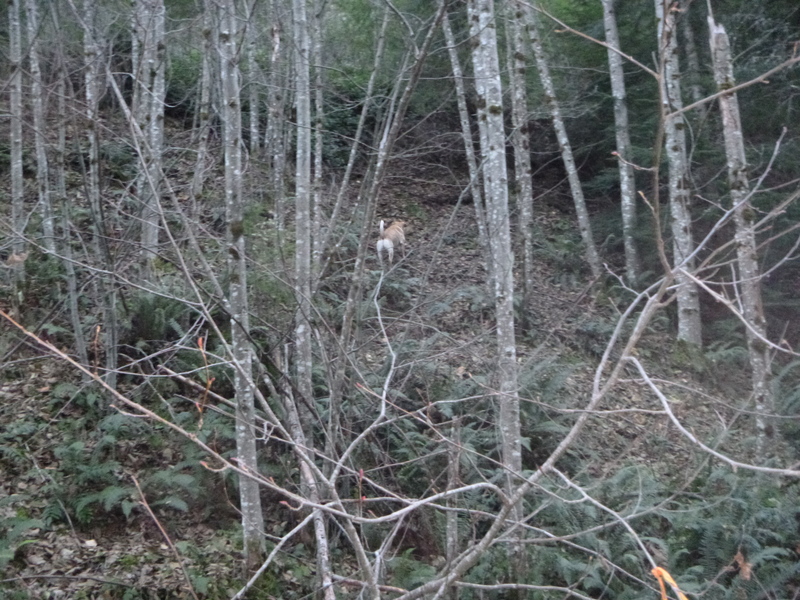 The area we hunt tends to attract a lot of deer hunters. Most of these folks are good, competent, experienced hunters, but it only takes one stupid mistake to turn a good hunt into a tragedy. That’s why I always outfit the dogs and myself with blaze orange vests as soon as the woods start to fill up with deer hunters. 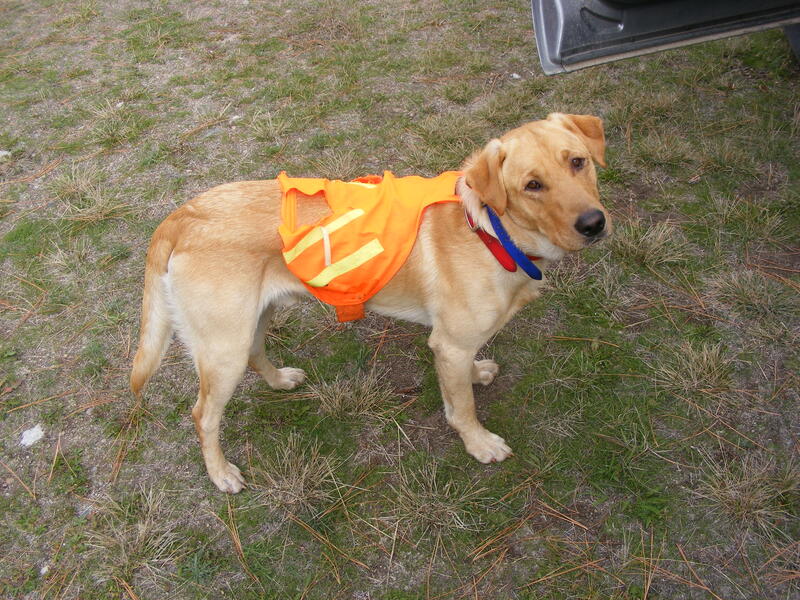 Several times during our hunts I found Peck running through the brush without his vest so I had to go back and find the vest and reattach it to the dog. I actually like this because I would rather see the vest come off than have it trap the dog in some briars or a fence. On the other hand, the shredding of the fabric was a constant annoyance as it made the vest even more likely to hang up on every bush, branch and stick that the dog brushed up against. Three days after the picture above was snapped, Peck’s vest was completely shredded and no longer useable. I dug out an old vest from my hunting stuff and he made it through the rest of deer season with a 3 year old vest that was made of stronger material. Unfortunately this vest is no longer available and its Velcro is almost worn out. I really liked the increased visibility both for the dog’s safety and for my convenience in keeping track of 2 flushing dogs in thick brush. I could definitely be interested in using the vests on all our hunts if I could find the right combination of availability, affordability and durability. The vest pictured above cost $14.95 plus shipping so it may be inexpensive but, it’s not really cheap enough for me to consider it disposable. To be fair I have to mention that Kaia’s vest made it through the whole trip. It’s definitely ripped up a bit, but I think Kaia considers it a fashion statement. I guess I could sew some new Velcro on that old vest that Peck was using. The girls at Woofers Grooming have already offered to dye him bright orange, but I’m not willing to try that… yet. Seriously, if you have some really great safety vest or other visibility enhancing solution, I’d love to hear about. Post up the name of the product and a pic if you have one. Thanks in advance!